PHILADELPHIA, PA - As family history and genealogy have emerged as global phenomena, millions of Americans are delving into the past to discover their families, their stories, and themselves. For many, however, the first step is the most daunting: Where to begin? Researching in a library or online present their own unique challenges for beginner and experienced genealogists alike. Listen close: Libraries are louder than you’ve heard. Sitting silent in the stacks and vaults are the booming soundscapes of the past: scores of sheet music, recordings, concert posters, songbooks, and more. Library card catalogs have become an analog elephant in the digital room. Once the preeminent form of bibliographic record keeping, card catalogs have now become more of an artifact than an effective resource for researchers – especially those online. As part of his ongoing series 1st District Difference Makers, Senator Larry Farnese stopped by HSP's historic Library in Philadelphia's Center City neighborhood for a conversation and tour with HSP President & CEO Page Talbott. The following article was written by HSP volunteer Randi Kamine and is being posted on her behalf. Part two of the article will be posted next Wednesday. Many thanks to Archival Processor Megan Evans for helping prepare these articles for publication. A slice of Philadelphia history may surprise those of us who live in and love our city. In the late 1930s and the early 1940s, Nazi party affiliates were active in several venues in and around the city. The German-American Bund, in particular, represented those whose sympathies lay with Hitler and Hitler’s Nazi movement. Formed in 1933, the Bund’s membership consisted of American citizens of German descent. 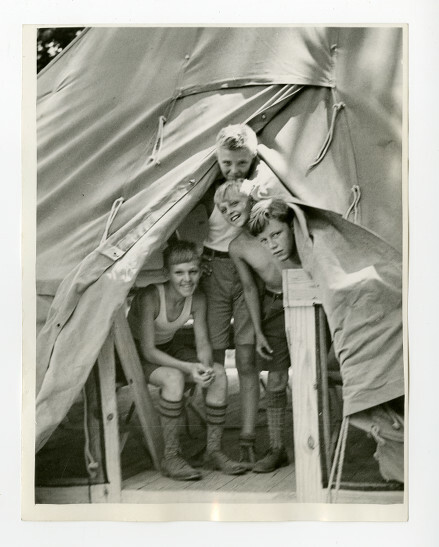 Its main goal was to promote a favorable view of Nazi Germany, although documents below show that their mission went beyond propagandizing to enlisting young sympathizers and even preparing for armed conflict. 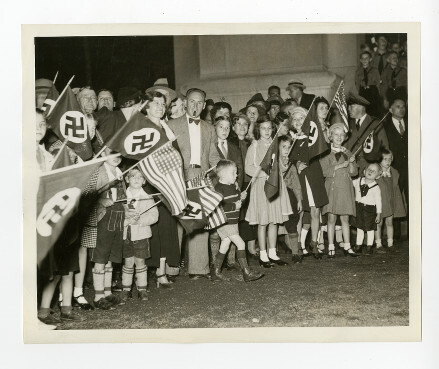 The Historical Society of Pennsylvania archives has photos and documents that trace the appearance and demise of this National Socialist movement throughout the Philadelphia region. The Philadelphia Record Photograph Morgue (Collection V07) that resides at HSP presents a record of how journalists investigated and covered American Nazi activity from before the Second World War to the American Bund’s demise in the early 1940s. 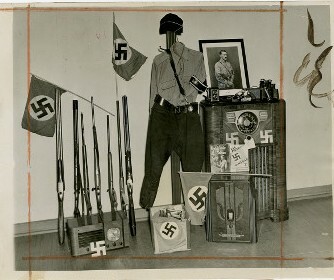 Among the photos are images showing items seized in raids by the FBI in homes purported to be local Nazi headquarters. 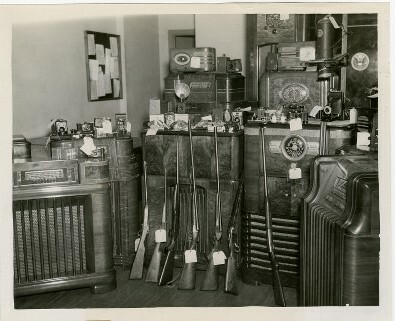 One photo, dated October 5, 1942, displays rifles, radios, and photo enlargers, “seized in raids in alien homes” according to contemporaneous notes attached to the photo. 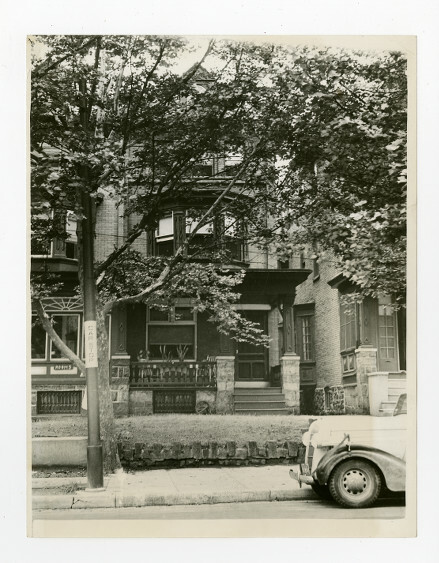 "Item[s] seized by FBI agents early yesterday in a raid on the North Philadelphia home of an enemy (German) alien"
An August 8, 1942 report showing another photo is entitled Symptoms of Fifth Column in Chester. 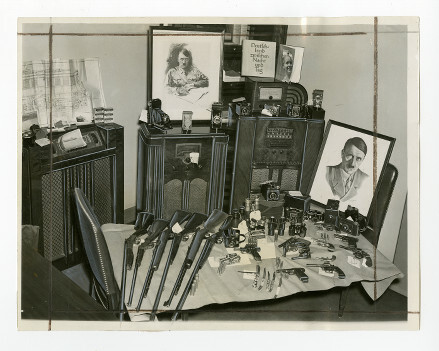 The author writes, “The contraband above, including rifles, revolvers, ammunition, cameras, radios and pictures of Hitler, was seized yesterday by FBI agents in extensive raids on the homes of enemy aliens in Chester and Marcus Hook.” The radios seen in the photos were no doubt used to be in contact with the Transocean News Service which the Commission declared had over 70,000 people on its mailing list. The news service was a wireless German news agency headquartered in Berlin designed by the German Foreign Office and operated by the Propaganda Ministry. "Seized yesterday [August 7, 1942] by FBI agents"
The photographs in the collection also depict the gatherings and activities of the Bund in and around Philadelphia prior to the war. In addition to contemporaneous photographs, HSP has several items that document the tenor of the times, particularly the fear that there existed a “fifth column” ambitiously at work to undermine the United States government. The reports of the famous House Un-American Activities Committee (HUAC) give the reader an insight into this mindset. In the popular imagination the Dies Commission is associated with the rooting out of Communist sympathizers. However, the Committee was originally created in 1938 to uncover citizens with Nazi ties within the United States. HSP has a copy of this initial report. 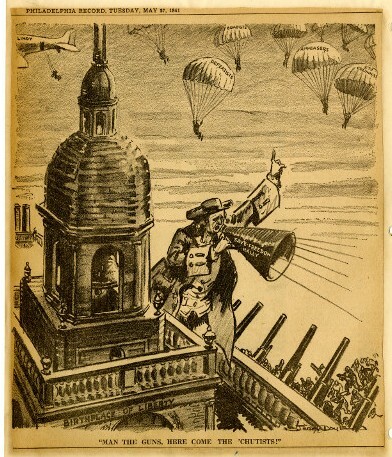 Among its claims, the committee states that the official newspapers of the German-American Bund had advance information on what was about to transpire militarily in Germany. Editions of the paper, Weckruf und Beobachter (Wake-up-call and Observer), appeared in Philadelphia. The extent to which the United States government was actually in danger is a subject for scholarly debate. It is clear, however, that the Dies reports as early as 1938 saw such a danger and that Philadelphia’s German-American Bund and related organizations were objects of investigation. The reports reflect what was to be written, or had been written, in Philadelphia newspaper reports mentioned above. Political cartoons from the Philadelphia Record depict the conflict between anti-war groups and those people who had a clear impulse to join in the war on the side of the Allies -- first with financial help, and in the end with military involvement. Among those against the war, it was hard to discern the line between Nazi sympathizers and other anti-war activists. 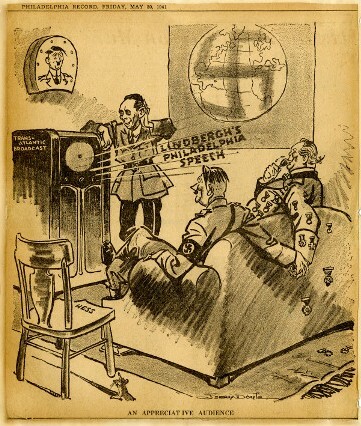 This first segment of two of “Nazi Sympathizers in Philadelphia Before the War,” highlighted photographs and political cartoons that are held at HSP. This is but a sampling. Those interested in Nazism in America, citizen reactions to this movement, and generally, Philadephia before the war, will find a wealth of information in these collections. The second segment will look at some of the Philadelphia Record newspaper clippings that are in our collection. HSP is proud to announce an online graduate course for educators beginning in 2016: Preserving American Freedom: A Primary Source Approach to Teaching American History. Governor Tom Wolf and First Lady Frances Wolf announced this week the designation of nine extraordinary women as Distinguished Daughters of Pennsylvania. These women were nominated by non-profit organizations within the commonwealth in recognition of outstanding accomplishments of statewide or national importance.